At a noon rally attended by about 800 people, a variety of speakers including faculty members and students addressed the crowd about the impact of budget cuts on education. Prior to the rally, fire alarms in six campus buildings had been pulled — sending students, faculty, and staff outdoors. “It’s not only about the cuts, but about transforming the way we look at education for the benefit of the students, the working people and the community,” said Eric Garcia, a political science major who helped organize the day’s protest activities. A red ribbon was tied to his bag; other protesters wore their ribbons as a sign of solidarity. Then the crowd headed to Doe Library, where protesters went inside and began gathering in the North reading room. The group had grown to about 500 people by 1:30 p.m. Some participants stood on top of tables, others banged on desks, chanting “Whose university? Our university!” and hung a banner up among the bookshelves. Students who had been studying in the library’s main room left; others continued studying elsewhere in the libary. By 2 p.m., UC Berkeley police had blocked off the reading room and were not allowing additional people to enter, citing safety and fire-code regulations. Around 2:30 p.m., Beth Dupuis, director of the campus’s Doe and Moffitt Libraries, addressed the crowd through a bullhorn held by University Librarian Tom Leonard. “I welcome you to this space.” she said, “but I ask that you respect it and respect your fellow students.” Dupuis asked that those present not deface anything, not stand on the tables, and respect students trying to study. “The building is open until 9 p.m.,” she said. As of 3:45 p.m., several hundred protesters remained in the reading room. At about 5 p.m, campus administrators, responding to a set of demands from the protesters, issued this statement. 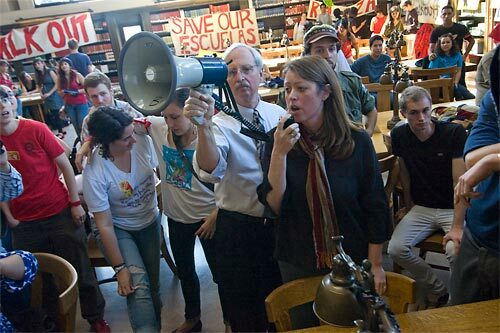 In the Doe North Reading Room, University Librarian Tom Leonard holds the megaphone as Beth Dupuis, library director, asks those present to act respectfully.